Welcome to the only place on the web where the spirit of black Paris past and present will entertain, enlighten, and inspire you, on a monthly basis. Have you already taken one of my Walking The Spirit Tours? Strolled the narrow cobblestone streets, peered up at the window where James Baldwin lived or had your picture taken at Place Josephine Baker? Then you’ll get to relive and learn more. If you're studying Black history for pleasure or academic gain, this blog will paint pictures between the lines of your books. And for those still daydreaming about Paris, lean yourselves forward and prepare to leave that armchair. Expect more than a history lesson. It’s going to be a personal journey for you the reader/participant and for me, too. Since 1994, I've been sharing the amazing and dismaying stories of our predecessors with visitors and Parisians. No surprise that their stories began to filter into my own, and it became impossible not to compare mine with theirs. Many of my African-American friends in Paris lived similar circumstances and came out with a wide range of outcomes. Those of us in contemporary Paris are simply continuing the time line laid down by the likes of artist Henry O. Tanner, James Baldwin, Josephine Baker, Bricktop, and the rest of the black community of expatriates. Month by month in this space I’ll put my personal spin on the stories of the most famous expatriates and the lesser known. It’s no secret the first visitors came for a taste of the legendary tolerance the French made their motto: liberté, egalité, fraternité. Among the first to visit and form their own opinion were former slave Frederick Douglass, Booker T. Washington, Mary Church Terrell, and W.E.B Dubois. Then followed artists, soldiers, entertainers, writers, and more recently, business people. One thing we and they all have in common : a stay in France has a way of cranking open the mind and body to new ways of being and thinking. The bakeries, gorgeous architecture, alluring river were and are all icing on the cake. I like to think of the expatriate Paris experience as a rebirth. For myself, I landed at Charles de Gaulle airport on February 1, 1990, raring to kick off a new chapter . After two years of floating in a touristy-buzz, hypnotized by the same bakeries, moody strolls across the river bridges, and feeling slightly crushed by splendor of the architecture, my raison d’etre plunked itself in my path. It beckoned through the footsteps of Langston Hughes. 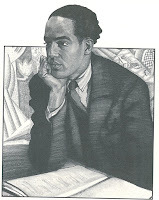 The poet of the people, the creator of jazz poetry was incidentally also born on February 1st, in 1902. The train that brought him to Paris for the first time huffed into the station in February as well. I met him however in my own north Paris 17th arrondissement neighborhood. After taking a course at the Sorbonne under the European expert on Black history, Professor Michel Fabre (from whose book I quote liberally here), I followed his 'Street Guide To African-Americans in Paris' and found myself at number 15 rue Nollet. Nothing much impressive about this nondescript Parisian building, guarded, bien sur, by a concierge and her mouthy miniature dog. I waited. When lunch inevitably called them away, I slipped in, mounted the six creaky flights up then there it was - his blue door, with a gaping 2-inch gap between the sawed off bottom and the stone floor. “The room was right out of a book and I began to say to myself I guess dreams do come true.” (from his autobiography The Big Sea). Poor Langston’s toes must’ve frozen in that drafty garret as he worked by day on the piece that was to become his very first paid poem. Then night after night while he washed dishes and emptied champagne bottles down the hill at Le Grand Duc nightclub, his head was buzzing with a revolutionary new type of poetry of his own creation- the jazz poem. Matching words to the rhythms of the fiery singer Bricktop while she entertained Europeans and prohibition-fleeing Americans out front, out danced the beat of 'Me & My Baby'. Can't say I ever harbored that mythical 'living and writing in a garret' dream. I came simply for a change from my Canadian existence;because I’m naturally a rolling stone; and because I’d always had an inexplicable thing for French culture. Like Langston, and like my fellow expats, I got caught up and worn down pretty quickly in the fighting off the French attitudes and going with the flow. Will the real Paris please show it's face? In the ‘20s, the dingy working class neighborhood around Place Clichy housed a jumble of immigrants and working class French. Today it’s still a swirl of donner meat stands, luggage shops, Arabic pastries, discount clothiers and black hair shops. Nothing like living the blues to write it right. Langston told black life in America like nobody else and scrounging alongside the working class and black people in the dregs of Montmartre brought painful inspiration. Finding a job was tough, what with the Italian and Polish newcomers willing to work for less than the low-paid French laborers. Langston's outstretched hand was resented, not because he was black but because he was further competition in a tight job market. He turned his new insights into race-conscious poems that later inspired the concept of the Negritude movement headed by Diaspora writers Aime Cesaire and Leopold Senghor. When he returned to Paris in 1937 much richer and famous to attend the second International Writers Congress, they cheered him as 'the people's poet'. True to his unwavering black pride, he chose to stay in his old ‘hood at a hotel run by an Ethiopian on rue Fontaine, known as Black Montmartre in the 20s. 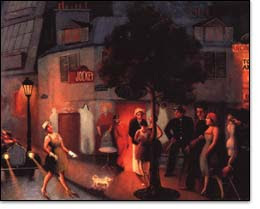 To him, the area felt more like Harlem than downtown St.Germain-des-Pres, headquarters for later writers. Let's move on to a few artists. The French episode left an indelible mark on their lives... for the good and the not so great. France played a cruel and decisive role in the life of artist Horace Pippin. This native of West Chester, PA was born on February 22, 1888 then moved to Goshen, New York where his deep attachment to rural black American family life formed the basis for his artistic expression. As a kid, Pippin got into lots of trouble drawing on his assignments at school but nothing could stop that pencil of his. Nothing except a bullet in the shoulder during World War I.
Pippin was a squad leader in the famous and celebrated all-volunteer black regiment, the 369th Harlem Infantry (more on them in March). 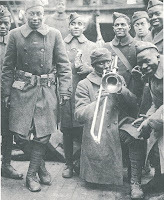 This unit doubled as a jazz band that marched their unheard-of music through the villages of Belgium, France and England. That bullet, however, in 1918 crippled Pippin’s drawing arm and it took eight impoverished years until he rehabilitated himself to burning wood paintings, which landed his work in New York Museum of Modern Art. Paris was sweet revenge for another February-born (02.29.1892) artist : sculptor, activist and educator Augusta Christine Savage. "My brother was good enough to be accepted in one of the regiments that saw service in France during the war, but it seems his sister is not good enough to be a guest of the country for which he fought... How am I going to compete with other American artists if I am not to be given the same opportunity." Those are the fighting words of the precocious seventh child out of fourteen in the Savage family. Augusta started molding clay animals as a child in Cove Springs and West Palm Beach Florida. Her talent was so impressive that an art critic from the Julius Rosenwald Fund awarded her two $1,800 fellowships. But national outrage hit the fan when a committee of seven white men denied her a scholarship to study at the School of Art in Fontainebleau because of her race. A bevy of fundraising efforts, however, got her to Paris, where she enrolled in the famous Academie de la Grande Chaumiere in 1929. Not a year later, she was basking in recognition at the prestigious Paris Salon art shows. A medallion from one of her African figures was reproduced for the 1931 French Colonial Exhibition. Back in the States, she opened her own studio in New York and spearheaded a fresh aesthetic in Black art. Her greatest monument, she said, was turning her talent to the teaching of young black people in New York. Her most famous works include: Gamin, The Harp, The Chase, Prima Donna, Black Woman, and Lift Every Voice and Sing. they were rewriting the foundations of black and European art. Contents of the blog are copyrighted. Email for reproduction permission. Great to see you're still walking the walk and talking the talk. I'd love to get back and do it again some day - last time 1996!